Every business leader knows that the key to growth is innovation—if you do what you've always done, you'll get what you've always got. 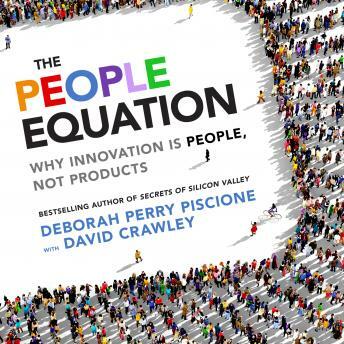 Deborah Perry Piscione and David Crawley argue that ultimately the key to innovation is people. After all, creativity is a uniquely human function, something that can't be automated. So how do you design an organization so that it provides the elements that will bear new thinking and bring forth bold ideas? Through The People Equation. Based on examples from their consulting work and research into successful business practices, Perry Piscione and Crawley's The People Equation enables leaders to create a culture where psychological safety is a given, risk taking is embraced, and collaboration between highly competent people is nurtured. When experiments and new initiatives look promising, Perry Piscione and Crawley's Improvisational Innovation process provides a road map to quickly develop ideas and bring them to market. All this requires upending the usual organizational pyramid and instilling a completely new mindset throughout the organization. Perry Piscione and Crawley show that in our rapidly changing world, the top is not where the really disruptive ideas are going to come from. And if people are afraid to take chances, even fail, you're never going to get those ideas—playing it safe means you'll be out of the game. The People Equation provides you with a formula for exponentially increasing out-of-the-box thinking in your organization and multiplying your chances for greater growth and success.